南部新英格蘭電話（英语：Southern New England Telephone）— Now wholly owned; the original AT&T held 16.8% interest prior to 1984. 德州西南貝爾公司（英语：Southwestern Bell） - a separate operating company created by SBC and merged back into SWBT on December 30, 2001. ^ 2.0 2.1 2.2 2.3 2.4 Annual Report 2016. AT&T. February 17, 2017 [February 21, 2017]. ^ 3Q 2016 AT&T by the numbers (PDF). [February 5, 2017]. ^ AT&T Makes Executive Appointments to Prepare for Time Warner Merge Close. AT&T. July 28, 2017 [July 30, 2017]. ^ AT&T executives to run combined company after Time Warner deal. Business Insider. July 28, 2017 [July 30, 2017]. ^ Lieberman, David. AT&T Formally Positions John Stankey To Run Time Warner's Assets. Deadline Hollywood. July 28, 2017 [July 30, 2017]. ^ Spangler, Todd. AT&T Confirms John Stankey Will Oversee Time Warner Post-Merger. Variety. July 28, 2017 [July 30, 2017]. ^ AT&T Sees Boost in wireless subscribers. （原始内容存档于2010-05-29）. ^ Kleinfield, Sonny. The biggest company on earth: a profile of AT&T. New York: Holt, Rinehart, and Winston. 1981. ISBN 0-03-045326-7. ^ 10.0 10.1 Godinez, Victor and David McLemore. "AT&T moving headquarters to Dallas from San Antonio." The Dallas Morning News. Saturday June 28, 2008. Retrieved on June 18, 2009. ^ AT&T Completes Acquisition of Time Warner Inc.. BusinessWire, Berkshire Hathaway. 2018-06-14. ^ New AT&T Launches (新闻稿). AT&T. 2005-11-18 [2007-09-29]. ^ Vorman, Julie. AT&T closes $86 billion BellSouth deal. Reuters. 2006-12-29 [2007-09-29]. ^ Bartash, Jeffry; Burton, Jonathan. AT&T to pay $67 billion for BellSouth. Dow Jones Market Watch. 2006-03-05 [2007-09-29]. ^ AT&T and BellSouth Join to Create a Premier Global Communications Company (新闻稿). AT&T. 2006-12-29 [2007-09-29]. ^ AT&T's new chief dialed in. Chicago Tribune. 24 June 2007 [2007-06-27]. ^ AT&T Buys Edge Wireless. Phone Scoop. 4 December 2007 [2008-07-26]. （原始内容存档于2012年9月7日）. ^ AT&T completes buy out of Edge Wireless. American City Business Journals. 18 April 2008 [2008-07-26]. ^ AT&T - News Room（December 3, 2007）. AT&T Announces Intention to Withdraw from Pay Phone Business by End of 2008. Press release. Retrieved on December 16, 2007. ^ Belgrade, Kevin. 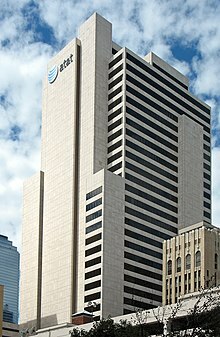 AT&T Corporate Headquarters to Move to Dallas. http://www.reuters.com/. June 27, 2008 [2009-08-21]. （原始内容存档于2009年4月20日）. ^ AT&T - News Room（June 27, 2008）. 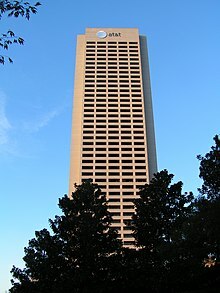 AT&T Corporate Headquarters to Move to Dallas. Press release. Retrieved on June 27, 2008. ^ Job cuts mount as year-end nears (新闻稿). AT&T. 2008-12-04. ^ AT&T Completes Acquisition of Dobson Communications to Enhance Wireless Coverage (新闻稿). Dallas, Texas: AT&T Inc. 2007-11-15 [2009-05-11]. ^ AT&T Agrees to Sell Certain Centennial Communications Corp. Assets to Verizon Wireless. www.newsticker.welt.de. 2009-04-09 [9 May 2009]. （原始内容 (Webpage)存档于2009年6月22日）. ^ AT&T Advanced Wi-Fi Strategy (新闻稿). Dallas, Texas: AT&T Inc. 2008-12-12 [2008-12-22]. ^ Agreements Between SNET America, Inc.（SAI）DBA AT&T Long Distance East, and AT&T Telephone Companies. AT&T. [2007-09-29]. ^ Ryan Gallagher; Henrik Moltke. The NSA’s Hidden Spy Hubs in Eight U.S. Cities. The Intercept. 2018-06-25 （英语）. ^ How AT&T Aided the NSA. WNYC. 2018-07-13 （英语）. Thierer, Adam D. Unnatural Monopoly: Critical Moments in the Development of the Bell System Monopoly. cato.org. AT&T buys IBM's Global Network. BBC News. December 8, 1998. Reardon, Marguerite. SBC closes AT&T acquisition. CNet News. November 18, 2005. Reardon, Marguerite. AT&T to buy BellSouth for $67 billion. CNet News. March 5, 2006. AT&T Whistleblower to Urge Senate to Reject Blanket Immunity for Telecoms. Electronic Frontier Foundation.